Win over Denver gives New England first-round bye in playoffs. 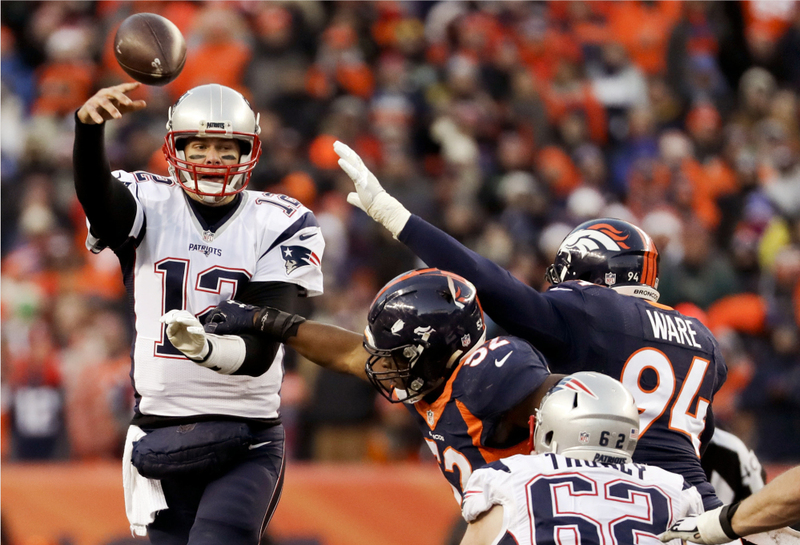 DENVER (AP) — Tom Brady brought a power run game and a sturdier offensive line with him to the Mile High City this time. This time, they only got to him seven times — the same amount Von Miller had in the conference championship. Miller didn’t get his hands on Brady at all Sunday. Brady missed his first six passes for just the second time his career — the first was way back on Oct. 12, 2003, against the Giants — but he came back to lead the Patriots (12-2) to a record eighth consecutive division title. Patriots: Host Jets on Saturday. Broncos: Visit Chiefs on Sunday.